Friday, December 1, 2017, London, UK: Researchers from the Biogerontology Research Foundation , Department of Molecular Neuroscience at the Swammerdam Institute for Life Sciences at the University of Amsterdam, and the Department of Neurobiology, Care Sciences and Society at the Karolinska Institute announce the publication of a paper in Translational Neurodegeneration, a BioMedCentral journal, titled RNAi mechanisms in Huntington's disease therapy: siRNA versus shRNA. After many years of development, RNAi therapeutics are nearing the clinic. There are several variants on RNAi therapeutics, such as antisense oligonucleotides (ASOs), short-hairpin RNA (shRNA), small interfering RNA (siRNA), et cetera. The researchers' paper aimed to answer the question of why RNAi therapeutics for nucleotide repeat disorders (specifically Huntington's, a devastating genetic neurodegenerative disease), have lost favor in recent years. After a phenomenal amount of excitement, these therapies were hindered by problems like molecular stability, dosing, and transcriptional control of the gene therapeutic construct. "We compared various RNAi-based therapeutic modalities available for the treatment of Huntington's Disease and offered mechanistic proposals on how to break through current barriers to clinical development. One key problem has proven to be modulating the expression level of shRNA constructs, which would otherwise be the clear frontrunner among ASOs, siRNAs, and other methods due to duration of expression, dramatically reduced off-target effects, and ease of delivery by adeno-associated viruses that are already approved by the EMA and FDA. We also put forward novel methods of modulating construct expression and avoiding off-target effects" said Franco Cortese, co-author of the paper and Deputy Director of the Biogerontology Research Foundation. 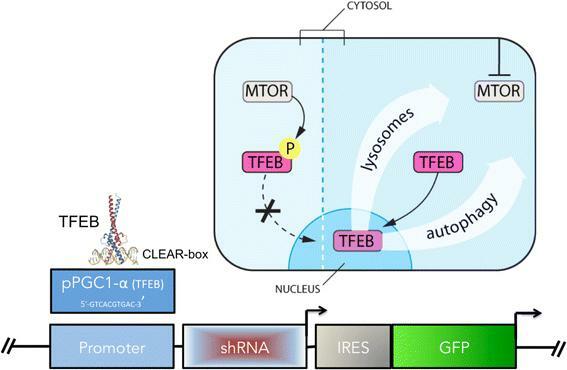 "We proposed two novel feedback mechanisms that 1) activate construct expression stoichiometrically with mutant Huntingtin expression, or 2) only during aggregate-induced autophagy and lysosomal biogenesis. That way, the problem of excessive construct expression may be mitigated. These ideas were inspired by feedback systems used in synthetic biology, and in 'nonsynthetic,' naturally occurring biological systems" said Sebastian Aguiar, lead author of the paper. The Swammerdam Institute for Life Sciences (SILS) is the largest institute of the Faculty of Science at the University of Amsterdam. The institute comprises biological disciplines including molecular and cell biology, microbiology, plant science, physiology and neurobiology, supported by modern enabling technologies for the life sciences. The research groups of SILS also develop methods in genomics (micro-array, next-gen sequencing, proteomics), bioinformatics and advanced light microscopy technologies. Knowledge from adjacent fields of science, in particular biochemistry, biophysics, medicine, bioinformatics, statistics and information technology make SILS a multidisciplinary research institute with a systems biology approach to the life sciences. SILS' research objective is to understand the functioning of living organisms, from the most basic aspects up to complex physiological function(s). Biological processes are studied at the level of molecules, cells, cellular networks and organisms. SILS research topics have in common that similar cellular processes and interactions are studied, likewise using similar methodologies and technologies. Therefore SILS scientists often study the same concepts in different biological systems. Within the institute, this leads to exchange of information and extension of research over the borders of different disciplines. Part of SILS research activities are directed to application-oriented research in close collaboration with industry.